Random Musings: One Project Down! I actually got motivated and completed one of the projects I mentioned yesterday. I gave the reusable snack bag a go since I had all of the materials I needed to make one...and since I got off work early and had some extra time. It was really simple to make. 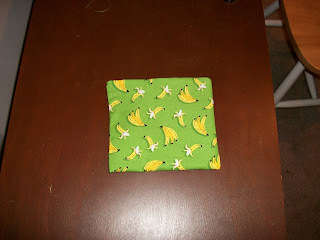 The hardest part was squaring up the fabric, but that's always harder than it ought to be -- even with my rotary cutter. I think it would be easier to make a pattern out of lightweight cardboard and use it to cut around. I used iron on Velcro since that's what I had on hand. 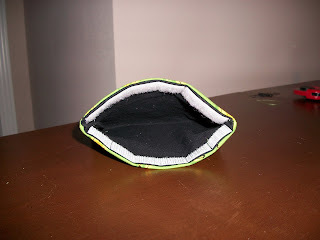 In the future, I will get some of the sew-on kind because I think it is more cost effective for projects like this and probably easier to work with. I wouldn't mind making some more. Anybody want to be my resident fabric cutter? I will be the resident sewing machine operator. This is one of those things that seem cute but I can't imagine rewashing them and the crumbs and stuff. The only things I can imagine putting in them are like m&ms or pretzels, not even crackers.